The Malaga Airport es located to the south- west of the city, within the municipality of Málaga, and it occupies an area of 273 Ha. 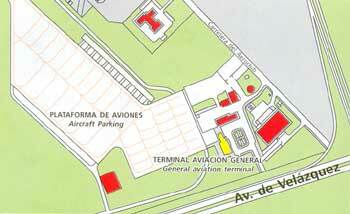 Its Latitude is 36º 40´29´´ N and its Longitude is 04ª 29´57´´ W.
The airport is linked to the city of Malaga by motorway E - 15 and the Avenida de Velazquez. the city centre of Malaga is at a distance of just 8 kms while Torremolinos is at 5 kms. General Aviation refers to the activities of private aviation, sport-related flights, air taxis, executive flying, aerial work, etc. The old passenger terminal, built in 1948 has been remodelled in order to better respond to the needs of this type of activity: customs, pasport control, ground assitance, VIP room.etc.